don't get caught: You've got quotation books on your speechwriting shelf. Now get this. You've got quotation books on your speechwriting shelf. Now get this. Thanks to forces ranging from the Internet itself to the propensity of modern folks to want to put words in the mouths of the ancients, it's difficult to know whether that quotation actually was said or written by the person you want to quote in a speech today. And while compilations of quotations are useful, perhaps more practical is a new book that gets behind the problematic quotes. 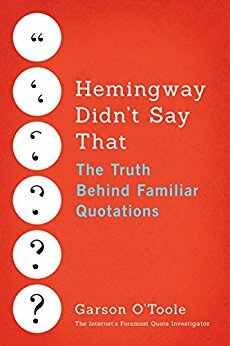 In Hemingway Didn't Say That: The Truth Behind Familiar Quotations, Garson O'Toole uses his own mishaps in searching for quotation sources, describes the forces that shape our misquotation habits, and offers "the first careful examination of what causes misquotations and how they spread across the globe." He groups them as mistakes made by groups, by readers, and by authors, and every chapter is loaded with famous quotes...and who really said them first. Naturally, this is a book loaded with references, a yeoman task that will save speechwriters lots of time. There's also a handy index by quotation, and another by author, making this a truly useful speechwriting bookshelf standard. For more on misquotation, check out my post Abraham Lincoln and Mark Twain called. 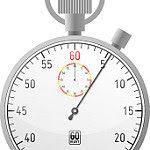 They want their quotes back, a good companion to this new guide, including other sources to check your quotes.